Dr. Darcy Umphred graduated from the University of Washington with a BS in Physical Therapy, from Boston University with a MS in Allied Health Education, and from Syracuse University with a PhD in Teacher Education and Theories of Learning. She has taught in both Physical and Occupational Therapy Programs throughout the United States. Over the course of her career, she frequently has taught educational programs both within and outside the northern hemisphere. Her love for clinical practice has driven her to question the “why’s” behind movement function and dysfunction. She is the editor of the textbook Neurological Rehabilitation that is in its 5th reediting process and is translated into a large number of languages. She has received numerous awards locally, within her state, and APTA sections, as well as being made a Catherine Worthingham Fellow in 2003. In 2004, she retired as chair and professor of the Department of Physical Therapy at the University of Pacific in Stockton, California and is now an Emeritus Professor. Her respect for the Profession of Physical Therapy and the two educated professionals, the physical therapist and the physical therapist assistant, has been demonstrated by her commitment to the responsibilities and services both professionals play in the delivery of physical therapy services throughout the world. Ms. Constance "Connie" Carlson graduated from the University of Evansville with an AS in Physical Therapist Assistance and a BS in Psychology. She later returned to the University of Evansville and graduated with a BS in Physical Therapy. She received her MS in Education from Mount St. Mary’s College. She was the Director of the Physical Therapist Assistant Program at Mount St. Mary’s College for 12 years and has taught in the college’s baccalaureate, master’s, and doctoral entry-level Physical Therapy Programs. She has been an advocate for the education and role of the physical therapist assistant throughout her career on a local, state, and national level, serving as a member of state government task forces and committees related to the physical therapist assistant. She has served as the Chair of the Education Section’s Physical Therapist Assistant Educators Special Interest Group and provides presentations on the appropriate use and supervision of the PTA on a local and state level. Her current professional focus is working with people with neurological disorders in community-based and wellness programs with an emphasis on enablement. Her love and respect for the physical therapy profession and the physical therapist assistant drives her commitment to enhancing the general public’s understanding of who we are and what services the physical therapist and physical therapist assistant provide to all of our patients and clients. "They (the authors) have succeeded in presenting throughout the text specific duties of the PTA and this supportive role to the PT in diagnosis and treatment. Sections flow with descriptive titles and helpful photos, illustrations, charts and tables. Interventions are well described within the text and often supported with comprehensive photos. 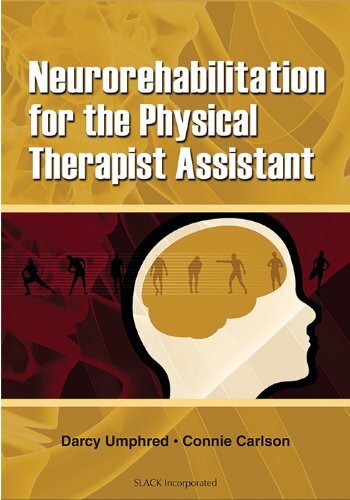 Neurorehabilitation for the Physical Therapist Assistant will be a welcome addition to my library and hopefully well-used in PTA programs." "This new book by Umphred and Carlson is one of the most comprehensive texts focused in the PT Assistants role."